Home > About > Leadership > Robert R. Redfield, M.D. Dr. Robert R. Redfield is the Director of the Centers for Disease Control and Prevention. He has been a public health leader actively engaged in clinical research and clinical care of chronic human viral infections and infectious diseases, especially HIV, for more than 30 years. He served as the founding director of the Department of Retroviral Research within the U.S. Military’s HIV Research Program, and retired after 20 years of service in the U.S. Army Medical Corps. Following his military service, he co-founded the University of Maryland’s Institute of Human Virology with Dr. William Blattner and Dr. Robert C. Gallo and served as the Chief of Infectious Diseases and Vice Chair of Medicine at the University of Maryland School of Medicine. Dr. Redfield made several important early contributions to the scientific understanding of HIV, including the demonstration of the importance of heterosexual transmission, the development of the Walter Reed staging system for HIV infection, and the demonstration of active HIV replication in all stages of HIV infection. In addition to his research work, Dr. Redfield oversaw an extensive clinical program providing HIV care and treatment to more than 5,000 patients in the Baltimore/Washington, D.C. community. 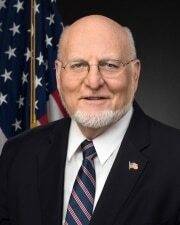 Dr. Redfield served as a member of the President’s Advisory Council on HIV/AIDS from 2005 to 2009, and was appointed as Chair of the International Subcommittee from 2006 to 2009. He is a past member of the Office of AIDS Research Advisory Council at the National Institutes of Health, the Fogarty International Center Advisory Board at the National Institutes of Health, and the Advisory Anti-Infective Agent Committee of the Food and Drug Administration.